If your anything like me you will spend a lot of time in your car, especially with the kiddies. 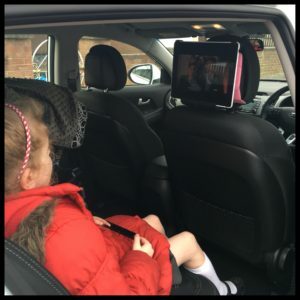 To keep them entertained on long journeys or stuck in traffic a DVD player or tablet is just the thing. We have a DVD player which attaches to the headrest of the car, however the DVDs can skip and jump with every movement of the car and thus starting the DVDs from the beginning much to the bewilderment of my little passengers. That is when I decided I wanted to load the ipad up with lots of tv shows and movies and get a iPad mount for the car. I looked at several different types which all seemed to have the same concept, ranging from large and bulky to small and minimalist, it was a minefield as to what one to go for. I didn’t want to waste any time or money trying out various different ones. Bearing in mind my car’s headrest poles are very thick compared to some cars, I needed to make sure whichever one I got was big enough to clip round the pole. 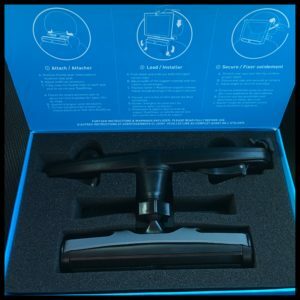 Spending weeks reading reviews on Argos, Amazon and Apple’s website I decided to go for the Felix Roadshow Universal Car Tablet Mount which retails at £29.99 available from Apple. First thing I noticed when I received it was the beautiful simplicity of the mount. There weren’t loads of parts to try and decipher and the stand has practical tool-less installation. The instructions where very easily set out by way of pictures on the box and a further instruction leaflet inside which I didn’t need to refer too. 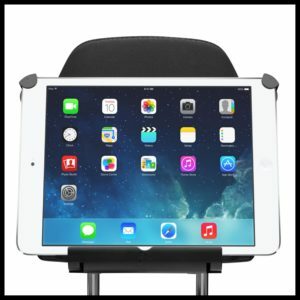 I literally clicked the stand onto the headrest in seconds and then just had to decide which width I needed for the iPad in its case. This was definitely a big plus for me, as I wouldn’t need to keep removing and putting back on the case before and after each use. You then just stretch caps over the end of your iPad or tablet to secure in place. 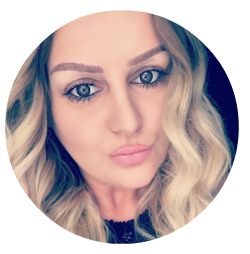 The ipad or tablet can be used in either portrait or landscape mode but you will more than likely just have the need for it to be in landscape mode whilst watching TV shows and movies. Once installed we took it on a road test and it did pop out of the holder straight away due to me not having secured the caps properly onto each end of the iPad, but once I secured it properly it hasn’t budged, even going over any ramps in traffic controlled areas. The ipad does move very slightly when the car is moving, as you would expect, but it doesn’t effect the viewing at all. 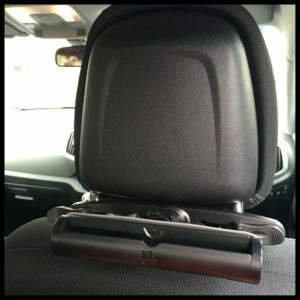 There is easy access to all buttons and headphone and charging socket, so if your backseat passengers want to switch to using it with headphones they can plug them in at ease. Overall I am really impressed with the sleek design, the adaptable angles for optimal positioning of the ipad, ease of installation, and it isn’t bulky when not in use and compliments the aesthetics of my car. 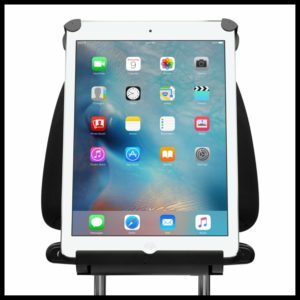 So if your looking for an iPad or tablet holder for turning your car into a multimedia centre, then I definitely recommend the Felix Roadshow Universal Car Mount.